Is Anosmia (Loss of Smell) Treatable? We have 5 senses: touch, sight, taste, smell, and hearing. We are familiar with or have come into contact with people who have lost some or all of their sense of hearing or their eyesight. But, it’s quite rare to encounter anyone with a loss of smell (and taste). According to various sources, the amount of people suffering from a loss of smell is small but is most likely larger than is indicated. The National Institute of Health estimates that 2 million Americans, or .62% of the population, have lost their sense of smell; The Toronto Star indicates that 1.2% of Americans suffer with anosmia, a complete loss of smell. Pare those with the percentage of people that suffer from sleep apnea or heart disease and you get the idea: loss of smell is uncommon and, in addition, it’s rather invisible. You can’t see it or touch it and those that suffer from it will often keep it to themselves, many out of embarrassment, which is why the percentage of people with a complete loss of smell may be higher than reported. Anosmia is the partial or complete loss of the sense of smell. To smell something, such as a juniper plant, a molecule from the plant stimulates the olfactory cells located in the nose which then sends information to the brain which identifies the smell of the juniper plant. If anything interferes with this process, we can experience a temporary or complete loss of smell (anosmia). specific medications, i.e., antibiotics, antidepressants, anti-inflammatory medication, heart medications, etc. medical conditions, i.e., Alzheimer’s disease, Parkinson’s disease, hormonal disturbances, etc. Is There a Treatment or Cure for the Loss of Smell (Anosmia)? Yes, in many cases, anosmia is treatable because it can result from an obstruction. And obstructions can typically be treated. The most common obstructions result from a deviated septum, nasal allergies, cold or sinus infections, nasal polyps, and chronic rhinosinusitis (CRS). A deviated septum and inferior turbinate hypertrophy (enlargement) can reduce one’s smell. On the other hand, those suffering with an inflammatory disease such as asthma, aspirin intolerance, and chronic rhinosinusitis (with nasal polyps) experience a more severe loss of smell. The good news is that a significant percentage of patients with anosmia can be successfully treated by ear, nose, and throat specialists at BergerHenry ENT. In some regions, the common thought is that severe anosmia is not treatable. It is thought that once the olfactory nerve is considered to be permanently damaged, there is no hope or treatment to repair it to the point where the sense of smell returns. However, Christine Kelly and a number of researchers are attempting to disprove that notion. She began offering smell training sessions to try to prove that anosmia (in this case, a complete loss of smell) is, in fact, treatable, and perhaps even reversible. She resides in England and, in 2012, developed anosmia after she recovered from a sinus infection that left her olfactory tissues damaged. Inspired by Thomas Hummel, the lead researcher at the Smell and Taste Clinic at Dresden University Medical School in Germany who pioneered smell training, she developed her own smell training sessions. Her latest was held in West Philadelphia at the Monell Chemical Senses Center, an institution devoted to the science of taste and smell. The idea behind smell training is that those with anosmia smell these oils 2x per day for a few minutes at a time. Other odors are also added to the mix including rubber bands and crayons, all with the hope of reawakening the brain. The test has worked for some but has not worked for others and researchers are still trying to figure out the reason(s). Some suggest that it may be related to the cause of the smell loss. Regardless, the smell training sessions appear to be a good start and have helped some. 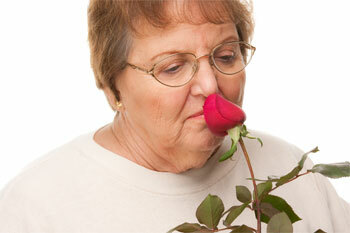 Further research is needed but anosmia is not talked about that much and a lot of people associate it with aging. With a bit of funding and more education, perhaps smell training, with the help of social media, can incorporate itself into the societal dialogue and reach more people suffering with it. If you’d like to find out more about anosmia and smell training, you can follow Christine Kelly at smelltraining.co.uk. If you suffer from a loss of smell, make an appointment to be seen by a BergerHenry ENT. As mentioned, a significant percentage of people regain their smell after visiting with us.